Welcome to my author website! If you are looking for “that loser guy”—yes, that’s me. Here’s a little background about me and this site. I was raised by a single dad, and we didn’t have much money. Wanting more, after high school I got a bachelor’s degree and a master’s degree; then I enrolled in a British university for a doctoral (PhD / DPhil) degree so I could qualify to teach college. After seven years of study, my PhD research was completed, written up, polished into my final doctoral dissertation (thesis), and deemed “ready to submit.” The last step was to fly back to England and defend my work in the final oral examination. But when I got there and entered the examination room, everything went sideways, or “pear-shaped” as they say over there. The shortest way to say it is that I permanently failed my PhD, with no refunds, no credits, no appeals, and no way to get the credentials needed for my desired career (for details, see FAQs – Failed PhD). Then, when I returned home, I lost my job. I was a true loser—on every front. I sank into a deep crisis of faith. The heartbreak and humiliation were excruciating, something I’d never wish on anyone. Nothing made sense; no hope was in sight. I could not imagine what God could do with a loser like me. I was a “C-minus” person in a “B-plus or better” world. During this long, dark night, I began to browse through materials I had created for my students when I was a youth minister—especially my old Bible study of Jesus’ twelve disciples. 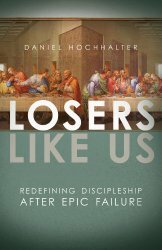 The disciples truly were “losers like us” who struggled with the same blunders and failures as we do, yet God still loved them and used them to change the world. Out of that study came new healing. And a book: Losers Like Us. Then, after nearly six years of being stalled on a dead calm sea with no movement and no means of propulsion, by God’s grace I felt a gust of wind in my sails: Losers Like Us was picked up for publication by David C Cook and was released August 1, 2014. (Cook found my book proposal online; for details, see FAQs – Getting Published via ChristianManuscriptSubmissions.com). This change marks a new chapter in my life, because there’s no turning back now: I have gone public as a bona fide loser for Christ. If you have already purchased my book, I thank you with all my heart and pray you will be blessed. If you haven’t but are interested, look for it at any of the online vendors listed on my Resources page, which also includes a free study guide and other resources. While other issues or events may be discussed at times, this website is by, about, and for losers, especially those who desperately fight feelings of being a loser. My prayer is that all who visit this site will realize that Jesus loves losers, and they are exactly the kind of people he uses to further his kingdom. My hope is that this site may be a refuge for the broken, where they can learn what it means to see their brokenness redeemed. I invite you to explore this website. Please contact me if you’d like to dialog, or to discuss speaking engagements. I know how it feels to experience loss and failure, and I’d love to be an encouragement.